The weather for the hike was predicted to be perfect hiking weather; sunny with temperatures starting in the low 50s and rising into the low 70s. With no morning rain in the forecast I was able to get an earlier start than my previous hike. My starting point would be the same, but I would be heading west. I left my house for the nearly two-hour drive as the sun began to rise. Ahead of me a full moon slowly set in the west as the sky brightened behind me. The drive was uneventful. I passed through a few areas of dense fog, but they did not last long. Shortly before 7:30 AM I pulled into the parking lot of the Econo Lodge in North Hornell. I parked along the edge of some shrubs near an old, now closed, restaurant. As before, I stopped into the hotel office to make sure it was OK to park. The desk clerk thanked me and said there would be no problem with where I had parked. I picked up my pack and started down the Econo Lodge’s main drive (mile 0.0 – 7:36 am). At the end of the drive I turned right onto Airport Road and walked along the shoulder of the road; there were no sidewalks. 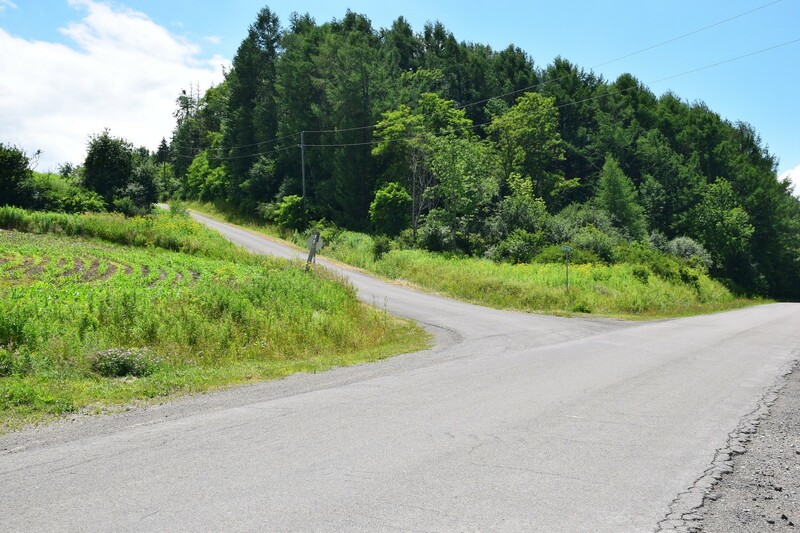 I reached the intersection of Webbs Crossing Road, turned left, and made my way to the large four-lane CR 36. The intersection was controlled by traffic signals (mile 0.6 – 7:47 am). Each of the turn lanes on CR 36 were segregated and had their own signal. In total I needed to cross six lanes of traffic. Although there were no sidewalks a crosswalk area had been marked by two parallel white lines on one side of the road. There were no crosswalk signals or buttons to press so I had to wait until the light changed. I hurried across as quickly as I could, but the light changed back before I was completely across the intersection. Fortunately it was early and traffic was very light. On my return trip later in the day it might be more difficult to cross. 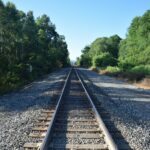 I continued my walk along the shoulder of Webbs Crossing Road until I came to a railroad crossing and turned left to follow along the bed of the railroad (mile 1.0 – 7:55 am). A very nice, and very new, parking area surprised me. 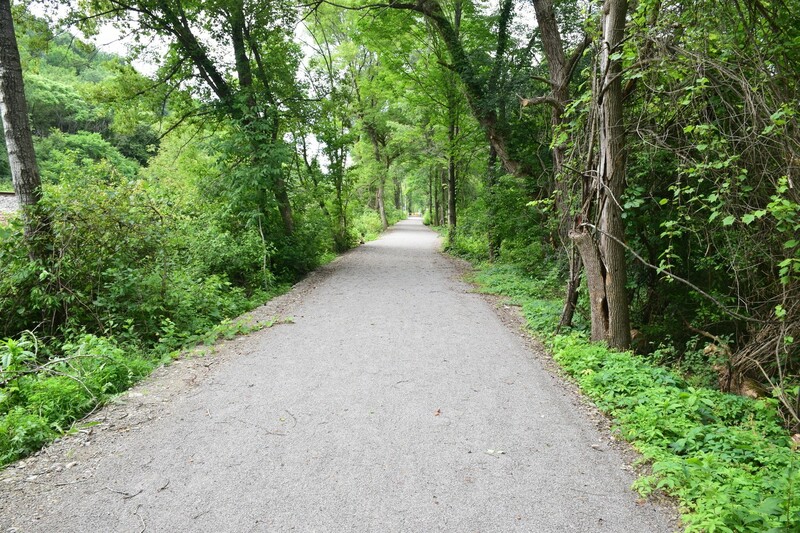 A rail trail ran next the railroad tracks beyond the parking area. I should have parked here! Railroad crossing south of Webbs Crossing Road (CR 66). 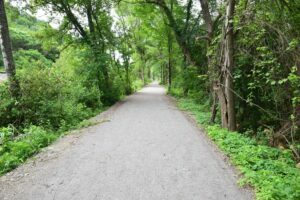 I turned down the rail trail, a level path packed down and topped with a hard gritty sand-like substance. I heard a few dogs barking from houses that bordered the trail, but saw no one either on the trail or at the houses; it was still early on a Sunday. 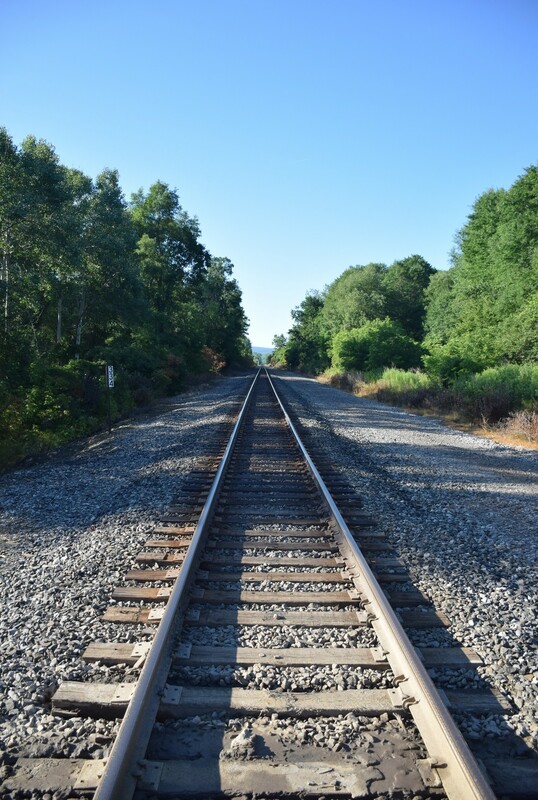 After passing a few crossings over the railroad tracks, I came to an FLT sign indicating that the trail turned right and crossed over the tracks (mile 1.7 – 8:09 am). I stopped to take a few pictures of the tracks and then headed off into the woods. 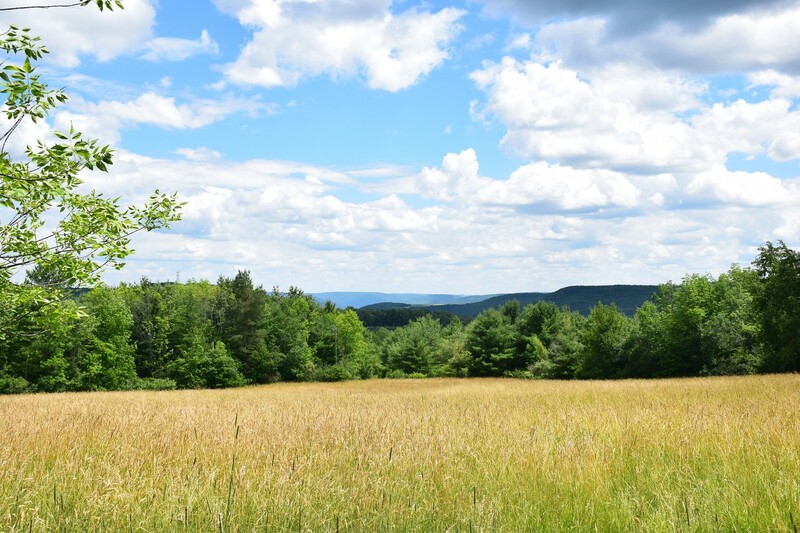 The trail ran parallel to the tracks for a short distance and then turned to the right and climbed up Bald Hill. The climb took me up about 500 feet in less than a mile. I reached the top of the hill and found a trail register (mile 2.5 – 8:29 am). The exertion of the climb left me sweating and my heart pounding. I stopped to take a break and sign in. I removed my shirt and hung it on the side of the register to cool myself down and to allow my shirt dry a little. After I had cooled and my heart had slowed I pulled my shirt back on and left the register behind. The trail started down the other side of the hill, but the descent was not as steep. Soon I found myself on the shoulder of Webbs Crossing Road (mile 3.2 – 8:58 am); the same road I had walked on a short time earlier to reach the rail trail. 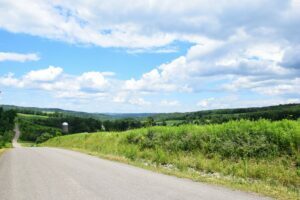 I turned left and headed up a rise in the road under bright sun and blue sky as cars whizzed past me on the paved road. I crested the rise in the road and descended slightly around a corner and past a Baptist church on my right. Just beyond the church I arrived at the intersection of Doorley Road. 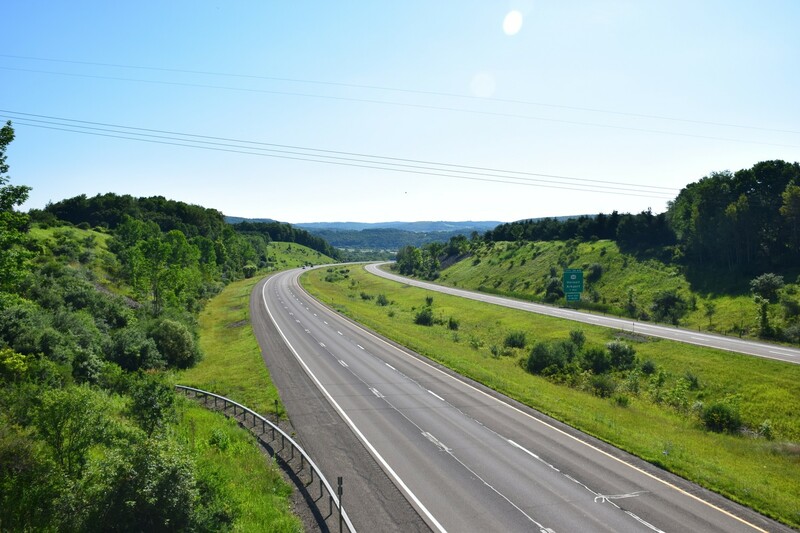 I turned onto the road and came to a bridge that took me over I-86/NY 17 (mile 3.8 – 9:10 am). I stopped to take a few pictures of the highway from up above before completing the crossing. On the other side of the bridge I arrived at an intersection with Webb Road. I turned onto this road and very quickly found an FLT sign at the edge of the road indicating the trailhead (mile 4.0 – 9:14 am). A steep bank descended on the other side of the guard rail to a small stream at the bottom. I climbed over the guard rail and made my way down the bank and across the little stream. I crossed several more small streams and gullies as the trail slowly climbed its way upward. Fortunately I had waterproof boots as I had to splash through a couple of the streams. 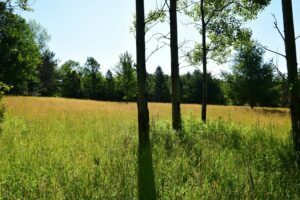 The trail climbed up gently for less than a mile and then opened out into a small field with tall grass. I stopped to take a few pictures and then waded through the grass heading to my right down a wide trail also overgrown by tall grass. The wide trail opened out at the top of another larger field also overgrown by tall grass. I took more pictures and then made my way across the top of that field. Upon reaching the other side I turned back to take a few more pictures; the light hitting the field had painted it gold and green. Once I left the field behind and returned to the woods I did a quick check for any ticks I might have picked up while wading through the grass; thankfully I found none. I crossed over a small stream and on the other side I glanced to my right at a fallen log. 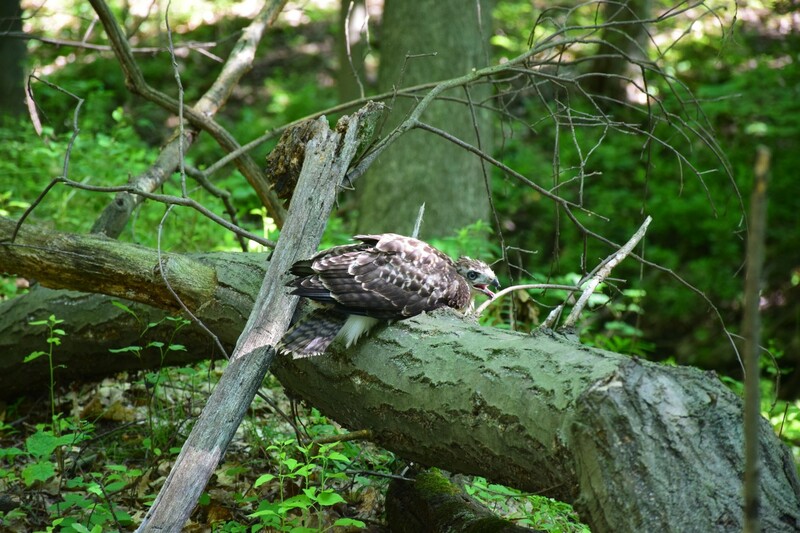 A hawk was perched on the log. I was unsure why it was just sitting there; maybe it was injured. Keeping my distance I took a few pictures zooming my camera lens all the way to its maximum. 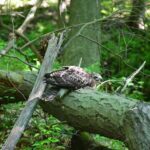 The hawk kept its eye on me as I passed, and I on it. After leaving the hawk behind I came, once again, to another field of tall grass. I waded in and passed by a small copse of pine trees near the middle. I thought it might make for a good place to stop and rest on my way back. After leaving the field I performed another tick check – none – and then moved through a short section of woods before coming out onto a dirt road; Fitzgerald Road (mile 5.3 – 9:52 am). Across the road I saw rows of Christmas trees. I crossed over and followed a tractor path up along the rows of trees. The path climbed up to the top of a hill and I looked back to see the hills and valleys spread out below me. I took a few pictures of the view through the trees and then continued on. The rows of trees ended and I came to more tall grass at the back of the field. 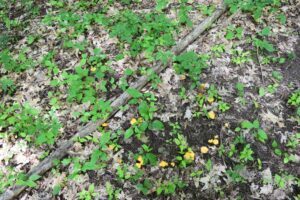 I waded through, performed another tick check – none – and headed into the woods on the trail. As the trail continued on through the woods I became lost in thought. I became aware that I had not seen a white blaze recently. I turned back and found that I had missed a turn, fortunately it was only a short distance back. The trail crossed over a small dirt road and then came to the corner of a field. It continued along in the woods paralleling the edge of the field. There was a fallen log at the corner of the field and I decided it was a good time and place to take a break (mile 5.9 – 10:09 am). I stepped out into the field and around the log and sat down. I took out a granola bar and poured some coffee from my thermos and relaxed enjoying the nice breeze and warm air. After a rest I picked up my pack and headed back to the trail and followed it down along the edge of the field. It soon curved to the left and opened out down a bank onto Pennsylvania Hill Road (mile 6.2 – 10:32 am). The FLT sign at the trailhead had broken and fallen off the post. I took a picture so that I could send it to the FLT Trail Report email later. The road descended down a hill and passed between several fields. At the bottom of the hill was the intersection with Bishopville Road. On my left I saw another Christmas tree farm. A red barn sat just beyond the trees and I stopped to take a picture. At the intersection (mile 6.6 – 10:32 am) I turned left and crossed a bridge over a small stream. I continued along passing a few houses and farm buildings. 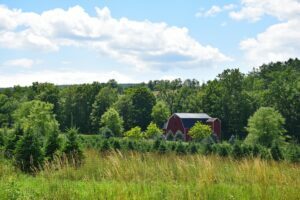 A large brown barn sat behind a freshly plowed field on my left. A man in a tractor passed by me and a short time later I found him in a field that bordered the road mowing the tall grass. I continued on along the road and came to a fork (mile 7.3 – 10:46 am). Wilson-Karr Road split off to the left and climbed a hill while Bishopville Road continued on straight ahead. The white blazes pointed up Wilson-Karr Road. I trudged up the hill. It was warm out under the sun and the pavement was making it feel even warmer. At the top of the hill I passed by a trailer home on my right. There were some people outside cleaning off a picnic table next to a smoking fire pit. I waved to them and said hello. Just beyond the trailer, on the left side of the road, I saw what looked like an old Christmas tree farm. The trees were now too tall and looked as if they had not been pruned in a few years. After leaving the old tree farm behind the road began to descend and entered an area with woods on either side. Ahead of me I could see an intersection. I noticed that there was a road sign at the edge of the road indicating “Yield Ahead”. I looked down the road and saw a stop sign – hmm, I guess I have been doing it wrong all this time! Immediately after stop sign at the intersection a dirt road turned off to the left (mile 7.9 – 10:58 am). A rusted metal gate at the side was open. On the right side of the road a speed limit sign of 10 MPH stood. Next to the speed limit sign was a caution sign warning of a hazardous area and only authorized personnel were allowed; that was a little disconcerting. However, the gate was open and there was an FLT sign there next to the caution sign, so I continued on up the dirt road. The road immediately split, an older section bearing to the left and a new section to the right. I could not see any white blazes so I decided to follow the new section. Not long after I caught a glimpse of a white blaze on a tree on the other side of the left branch. Ahead of me I could see that the left branch came back to join this new branch, so I continued on up the road. The dirt road turned to the right and the trail turned off the road (mile 8.2 – 11:03 am). A short distance off the road I came to a fallen tree across the trail and I decided to take a break. I sat down on the log and pulled out a bottle of water. After a short rest I continued on. 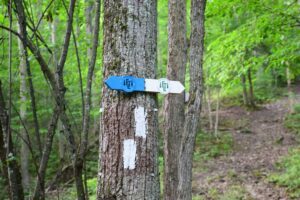 The trail made its way through the woods and then opened out onto Bishopville Road once again (mile 8.7 – 11:26 am). I waded through some tall grass and weeds at the side of the road, turned left onto the road, and head down into a hollow before heading back up the other side. The trail turned to the right off the road and climbed up through more grass and weeds (mile 8.8 – 11:29 am). Scattered through the weeds I saw some wild parsnip growing. I carefully pushed by the plant; for some people the sap of the plant can cause skin irritation and scarring – I didn’t want to find out if I was one of those people. The trail climbed gently up a hill and came to a split. 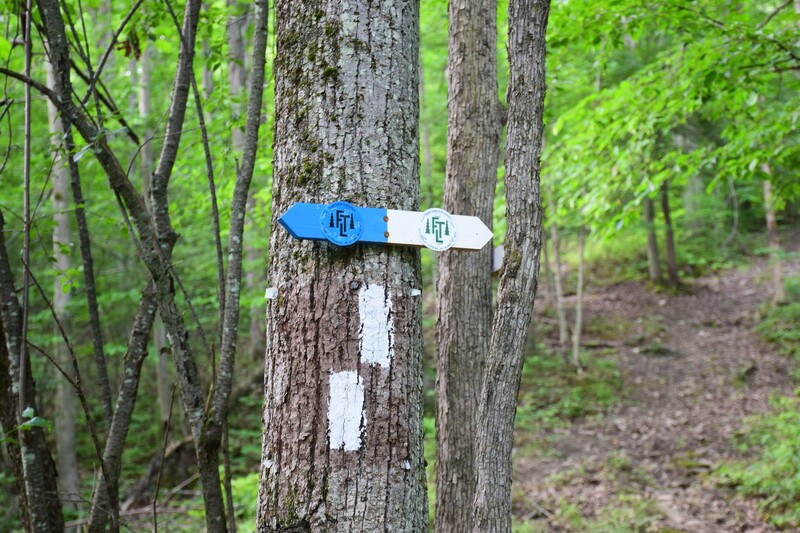 A nice sign indicated the blue spur-trail to the left and the white main trail to the right. I followed the white trail and it began to climb up a hill. It wound its way through alternating sections of pine trees and hard woods. Some areas had more undergrowth than others. The trail began to level out and soon after I came to Karr Road (mile 10.0 – 12:01 pm); a small dirt road and my turnaround. After checking out the parking situation – I planned to park here on my next hike – I started back. I descended down the hill and past the trail split with the blue and white sign. Soon I found myself back on Bishopville Road and heading down the hollow in the road and back up the other side. I left the road and waded into the tall grass and weeds and then continued on up a small climb. After a short walk I arrived at the fallen log I had rested at earlier. I decided this was a good place to stop for lunch and rest (mile 11.8 – 12:47 pm). I dropped my pack, pulled my boots and socks off, and took out my lunch. After eating my lunch and relaxing I pulled a fresh pair of socks and my boots back on, picked up my pack, and headed for the dirt road. The sun was warm on the back of my neck. I took out a small towel and positioned it under my hat so that it would drape over my neck and shield me from the sun. At the end of the unnamed dirt road I passed out through the gate and turned right to start back up Wilson-Karr Road. I climbed to the top of the road and passed by the old tree farm and trailer, and then back down to the intersection with Bishopville Road. I turned right and continued down the road. After a long road walk I came to the tree farm with the red barn at the corner of Pennsylvania Hill Road. Continuing to the right up the road, I finally came to the trailhead and the end of the two mile road walk (mile 13.8 – 2:05 pm). I left the road and followed the trail up along the field and past the corner where I had stopped earlier. I considered stopping again, but I was not ready for a break yet, so I continued on past. The trail opened out at the bottom of the Christmas tree field and I waded through the tall grass. I continued on past the rows of trees and then down across Fitzgerald Road. Once across Fitzgerald Road I was soon wading back through the field of tall grass. I passed by the copse of trees in the middle of the field, but did not stop; I was still not ready for a break. After wading through all the fields I was back in the woods once again. I stopped to check that I had not picked up any ticks and then continued on. I crossed over the small stream where I had seen the hawk earlier. 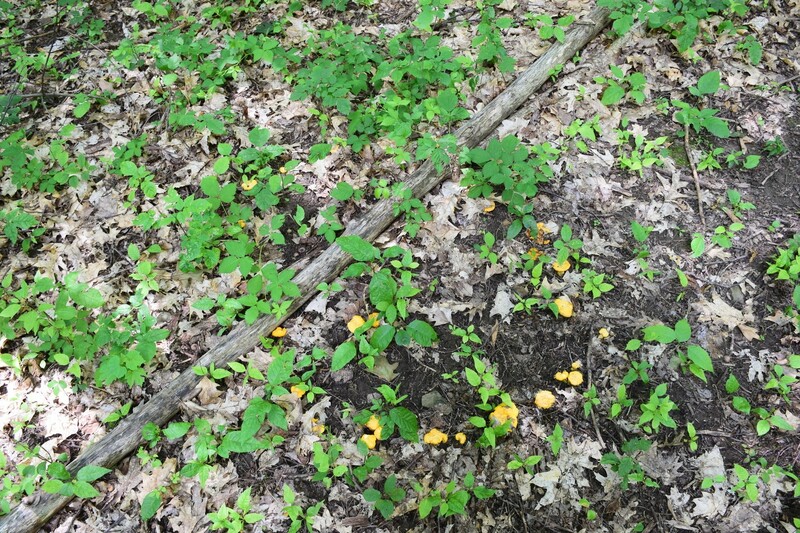 It was gone now, but this time I noticed several “Fairy Rings ” of mushrooms I had missed before. I continued on and nearly stepped on a large toad. It hopped away and I tried to take its picture, not very successfully. As I neared Webb Road I came to the small streams again. I was hot and stopped at one of the streams to dunk the towel in the water. I wiped the cold wet cloth over my face and neck; it felt great. 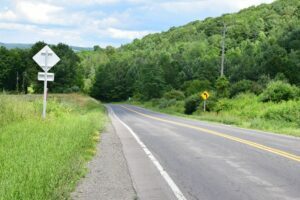 After crossing the last of the little streams I climbed up the bank to Webb Road (mile 16.0 – 3:03 pm) and turned left toward the intersection of Doorley Road. The towel was still cool and wet and I draped it over my head and neck to keep myself cool. I crossed the bridge over I-86 and then headed back along Webbs Crossing Road, past the Baptist church, and up the small rise. On my way down I looked to my left and saw I-86 curving through the valley in the distance. 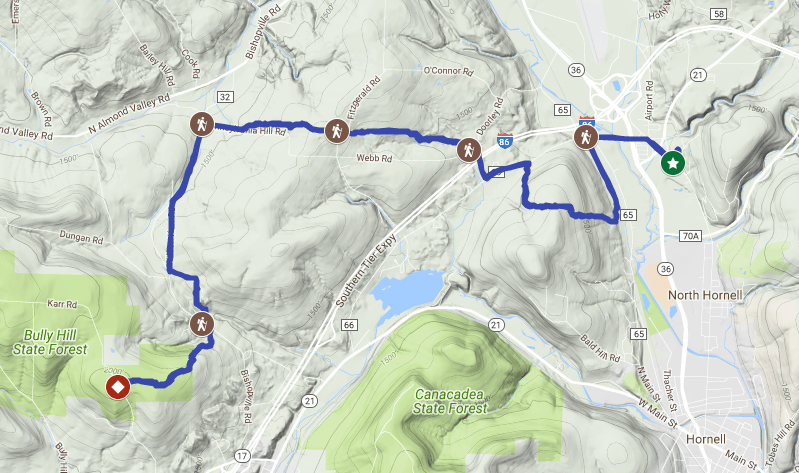 I left Webbs Crossing Road behind and turned back onto the trail once again (mile 16.8 – 3:17 pm). The climb up Bald Hill lay ahead, so I decide to stop and get a snack and some water. After a brief rest I started up the hill and a short time later I arrived at the trail register. I stopped and took another break; ahead of me was a 500 foot descent and I was getting tired. I took my time heading down the hill and was very happy once the trail leveled out. Not long after I crossed the railroad tracks and turned onto the rail trail (mile 18.2 – 4:07 pm). 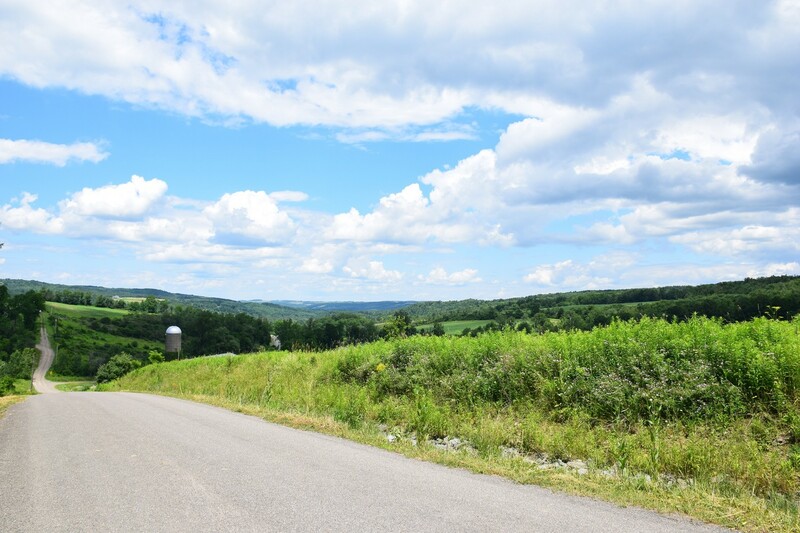 I headed north along the trail, back to Webbs Crossing Road. People were out walking and biking on the trail now. At the end of the rail trail I turned onto Webbs Crossing Road, walking along the edge of the road. Soon I arrived at the busy intersection of CR 36 (mile 19.3 – 4:27 pm). Luck was with me, I arrived at the intersection just as the light was changing my way. I crossed as quickly as I could and then trudged the rest of the way up the road to the intersection. I turned right onto Airport Road and finally found myself back at the entrance to the Econo Lodge (mile 19.7 – 4:34 pm). Although I was ready to drop my pack and stop walking, I still had a short distance up the entrance road to go. Finally I reached the parking area and turned the corner to see my car parked along the shrubs (mile 19.96 – 4:40 pm). I changed into a fresh shirt, exchanged my boots for sandals and started out on the long drive home.